In Desmond and Jean Bowen’s book ‘Heroic Option’ The Irish in the British Army they suggest that apart from Irish Regiments raised in Ireland some 159,000 Irishmen were integrated into Enlish Regiments in the period 1793 to 1815. This process started after the Duke of Marlborough’s Wars on the Continent and the practical abeyance of the Penal Laws. In 1774 by a statute an earlier religious test was replaced by an oath of allegiance. There was an immediate surge of Catholics enlisting in the British Army which is reflected in these records. In the late 18th and early 19th century Cork was a boom town on the back of the provision trade. The various British colonies and the British Navy and Army were supplied and many from a modest background came from the shadows of the penal Laws to establish fortunes, many of whose families are still prominent in Cork. 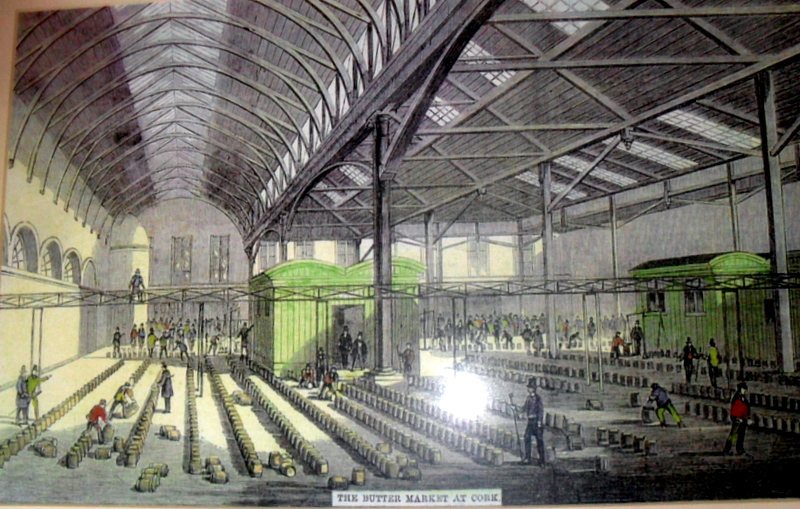 The drawing below shows the Butter Market probably in the early 19th century. In its heyday its insistence on quality and honest dealing made it the benchmark for world butter prices. In an interesting book recently published John A. Quish “100 Years of going to the Creamery he points out that after the famine Irish butter dominated the British market. By 1900 it had been displaced by the Danes whose quality and all year around supply ensured that they had a dominant position. He also chronicles the work of Horace Plunkett and Forbes in building up the Co-Op movement. Often their work fell on fallow ground against a background of suspicion and ignorance. The county population was 150.687 of whom 81.731 were from a Protestant background. 41 Presbyterians reported Irish only probably wrong as did 78 Church of Ireland 4 Methodists Irish and English for Presbyterians 61, Church of Ireland 94 Methodist 4 and 26 miscellaneous. Copy of the memorial of Arthur Lemuel Shuldham [of Dunmanway, Co. Cork] to the commissioners of the Excise, asking them to remit the costs of a suit begun by the Commissioners against Shuldham’s pleasure yacht, built at Bristol in May 1789 at a cost of £2000. The yacht was condemned by the jury, and orders were given to dispose of it ‘and your memorialist thereby lost many things therein not belonging to the said vessel’. The peculiar hardship of the case, and the largeness of Shuldham’s family make him hope that the commissioners will remit the costs. The document is neither signed nor dated. Access to this collection is unrestricted for the purpose of private study and personal research within the supervised environment and restrictions of the Library’s Palaeography Room. Uncatalogued material may not be seen. Please contact the University Archivist for details. Copies may be made, subject to the condition of the original. Copying must be undertaken by the Palaeography Room staff, who will need a minimum of 24 hours to process requests. This writer quotes a faying of Themistocles the Athenian, Put but a poor and languid city under my care, and I will render it rich and flourishing; Which kind of ability; is what alone. he says, constitutes a great and able politician. Sir Richard Cox of Ireland in the year of 1733, came to the possession of a large, fruitful but uncultivated tract of land, inhabited by a race of beggars, grown by habitual wretchedness so hardened that tho’, no sensible of the smart, they were not ashamed to prefer hunger and idleness to labour and competency. He therefore, directed his thoughts to remedy this evil; and wisely concluded that nothing but the establishment of a staple manufacture on the premises would answer the purpose. For very sufficient reasons he chose the linen; and having procured a quantity of flax seed in 1735, prevailed with them to sow it and by dint of perseverance, and a series of admirable expedients to rectify his own mistakes, to render sloth infamous, to excite emulation, to increase his colony, if it may be so called, and to interest all the passions of those concerned in its success, he at last fixed it on such an establishment, as, if the same laws are observed, bids fair to to perpetual. Already the little town has undergone a wonderful change; for whereas, in 1735, it contained ay most but 50 houses, many of them only fit for beggars, it now contains 117 houses, whose inhabitants are fully employed and take pleasure in being so. This is true patriotism and policy united; a sphere of ambition, that every gentleman may follow innocently; laudably, and profitably. Jim Herlihy’s short history of the RIC (Four Courts Press 1997) quotes from two travel accounts of the new force in the 1840s in West Cork. 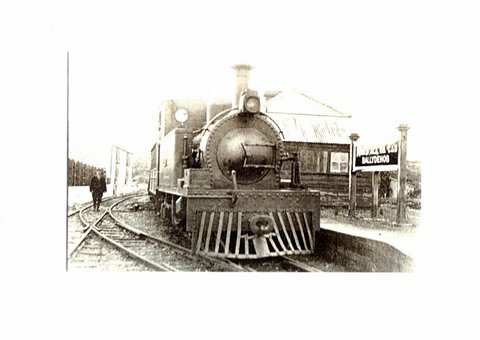 The police station we first visited was Ballyneen, a village near Dunmanway which we were merely passing through, and of course as our inspection was quite unlooked for, it was consequentially unprepared for. The sergeant, a remarkably fine and intelligent young man, Alex Hewson, readily complied with our request to be permitted to examine his barrack. It contained five men, strong and active fellows: the rooms were all whitewashed, the little garden was well-cultived and free from weeds. The men slept in iron bed-steads, and the palliasses, blankets, pillows etc., were neatly rolled up and placed at the head of each. The firearms and bayonets, each as polished as a mirror, were hung up over each bed, and the floors were as clean as ‘a new pin’. Each man had his small box at his bed foot. All was in perfect order as if it had been prepared in this little out-of-the-way place for the accustomed call of the inspector. The sub-inspector we learned, visited the station once a month and the inspector once a quarter. In tis barracks the men were all bachelors; but it was usual to assign one married man with his wife to each barrack.-the wife of course, arranged the rooms, and provided the meals of the men who always mess together. We afterwards examined many other stations and invariably found out first impressions borne out. Widely distributed as they (The RIC) are, they are proving very effective. The walls of the little inns at which we stop to change horses were generally placarded with numerous government proclamations, offering rewards for the discovery of criminals, those who burnt houses, committ ed murders etc. Going by mai car pver a wild road from Bantry to Kenmare, I passed one of the new police stations which I notices as having a fortified like appearance of the military stations so picturesquely situated in the wild regions of the Austrian frontier. I got off the car to inspect the place and had a talk with the sergeant in charge who provided me with much much interesting information. 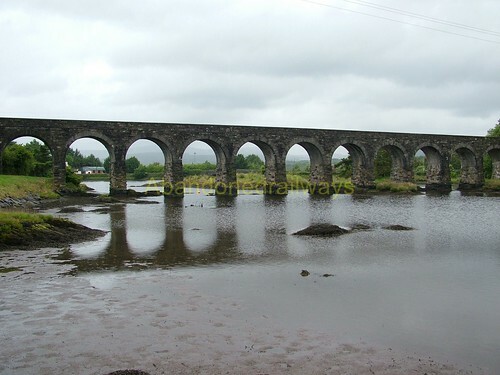 The sergeant informed me that the county of Kerry was comparatively quiet but that in certain districts, Tipperary for instance, riots, party fights and murders for revenge were the order of the day, and that in these days, there were police stations every three of four miles. Thomas was an artist whose paintings won him world-wide fame. He was born in Dunmanway, County Cork, Ireland. At the time of the potato famine he was six years old and placed in an orphanage as his parents had died. He studied at the Cork School of Design as he was apprenticed to a carver and gilder. He immigrated to the United States in 1863 and studied at the National Academy of Design in New York City. In 1868 he moved to Baltimore, Maryland and in 1874 went to Paris. He studied at the Ecole des Beaux Arts under Cabanel. However most of his time was spent with the American Colony at Pont-Aven in Brittany led by Robert Wylie. Here he painted many pictures of the peasantry. In 1880 he retruned to America and became a member of the Society of American Artists and an Associate member of the National Academy of Design. He was elected Academician in 1882. Thomas married, on June 9, 1881, Helen Corson the eldest daughter of George and Martha (Maulsby) Corson and settled on Helen’s father’s homestead in Plymouth Meeting, Montgomery County, PA. He made his studio in their barn, known as Abolitionist Hall due to its use for anti-slavery meetings. He was appointed Professor of Painting and Drawing at The Pennsylvania Academy of Fine Arts in 1886. The sculpter Alexander Stirling Calder and the leader of the Ashcan School, Robert Henri were two of his students. Among his well known paintings were: “John Brown Being Led to Execution”, “In the Hands of the Enemy”, and “Breaking of Home Ties” which were all on exhibition at the World’s Fair in Chicago in 1893. Another was “The Home Coming”. Thomas and Helen had two children: Thomas Hovenden, Jr., born March 11, 1882 and Martha Maulsby Hovenden, born May 8, 1884. The Donegan project now online contains records from native Irish speakers collected by a German team in 1928-1931. Included are recordings of songs etc. from native speakers from Ballymacoda in East Cork where Irish is now extinct. LC	1821	9	22	NPD	CONNELL	John Shadwell	Field-Mar	At Rio de Janero, aged 77, Field Marshal John Shadwell CONNOR, Counsellor of War,. He entered the Portugese service as Captain, in 1763, with leave, being then a Lieut, in the British Army.